Dr. Rabon received his medical degree from the Northeastern Ohio Universities College of Medicine and completed his ophthalmic surgery residency at the Cleveland Clinic Foundation. He is board certified by both the American Board of Ophthalmology and the American Board of Eye Surgery. He is an Assistant Clinical Professor at the Quillan College of Medicine. Dr. Rabon is a member of the American Academy of Ophthalmology, the American Association of Cataract and Refractive Surgeons and the International Society of Refractive Surgery. Additionally, he is a fellow of the American College of Surgeons and the American College of Eye Surgeons. In practice since 1986, Dr. Rabon became involved with LASIK in 1995 when he trained under Dr. Jeff Machat (TLC’s founder) at TLC Windsor (Ontario, Canada). 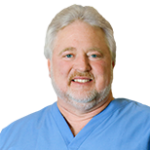 He was among the very first ocular surgeons in Tennessee to offer LASIK in 1997, and he personally enjoyed having LASIK performed on himself in 1999 (at TLC Toronto). He has currently performed over 15,000 LASIK procedures (and he is still 20/20 himself). He performs laser vision correction exclusively for TLC, and serves as a Regional Proctoring Surgeon and Regional Medical Director for TLC. He has studied and lectured extensively on laser vision correction, and views it as the most rewarding part of his practice. He was honored in both 1999 and 2000 with the Visx Star Award recognizing him for being in the top 5% of refractive surgeons nationwide. He feels that the greatest compliment of all comes from the many eye doctors who have trusted their eyes (or the eyes of their family members) to him.